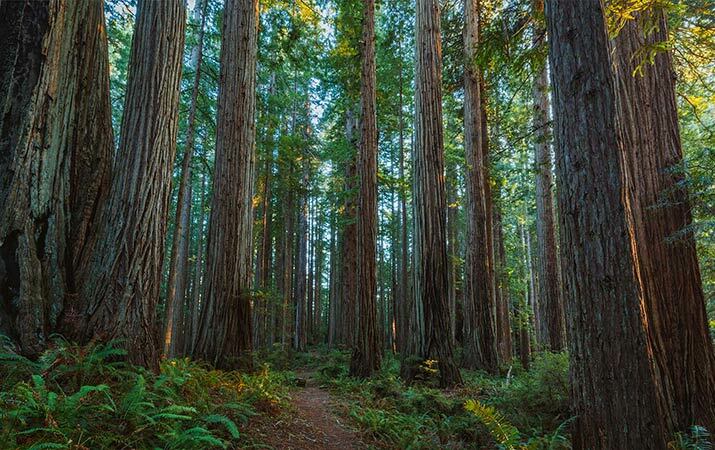 Coast redwoods are the world’s tallest living trees. 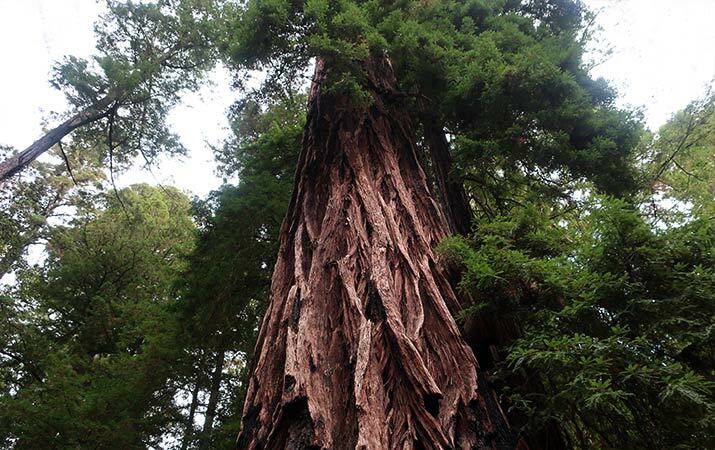 Redwoods are prehistoric – redwood fossils date from 200 million years ago. Redwoods trees once grew throughout much of North America, now ancient coast redwoods are found only on the California coast, and in a few groves in southern Oregon. Today, due to conservation efforts started more than a hundred years ago, remaining old-growth coast redwoods are saved for future generations. Visit nine different California parks to discover spectacular coast redwoods, from the top of northern California down to the central coast. Coast redwoods grow more than 300 feet high, taller than the Statue of Liberty. Many old-growth redwoods are 500 – 700 years old, some are over 2,000 years old. The trees grow from tiny seeds that pop out of cones, or they can sprout from bulging burls around the base of the living redwood. Coast redwoods can form “fairy circles” of trees that sprout from a stump, or twin trees that grow up together. Coast redwoods need plenty of water. Leaves help preserve moisture from fog and rain, the tall trunk pumps water up to the highest branches in the tree, the canopy. The canopy, hundreds of feet above the ground, is home to plants and wildlife. In these “gardens in the sky” live spotted owls that make their nests in the trees, salamanders, woodrats, bumbleebees looking for huckleberries, eagles, flying squirrels, wasps, ladybugs, eagles, chipmunks. Fires are part of the redwood forest ecosystem – fires reduce overgrown plants and shrubs on the forest floor, providing more light for new redwood trees to grow. Along the trails in the redwood groves, you’ll see numbers of fallen redwood trees. Coast redwoods grow very tall, but have a shallow root system and naturally topple over. Essential to a healthy forest, fallen trees become “nurse logs” – ferns, fungus and wildlife make their home here. Jedediah Smith State Park has multiple redwood groves. Our favorite trail is the Simpson – Reed Grove Trail. Not only is it the most accessible, but it feels like an enchanted forest. Along with redwoods towering into the sky, on the forest floor are carpets of ferns, and wispy lichen floating on tree branches. 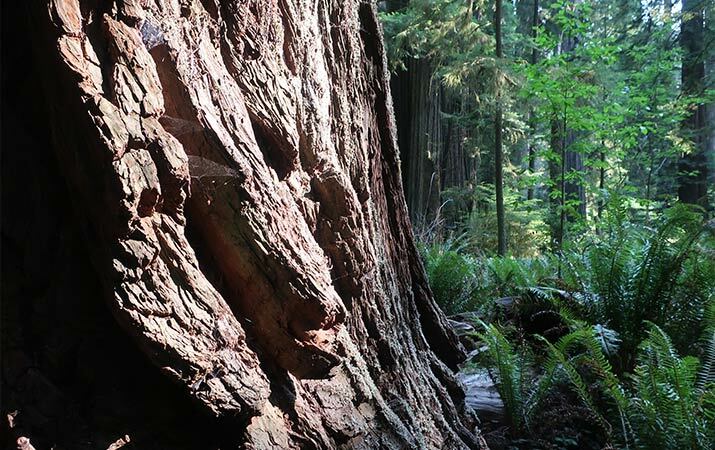 Take the Stout Grove Loop trail to see the largest redwood in this state park, the Stout Tree, named after Clara Stout who donated acres of redwoods to save the trees from the sawmill. The Boy Scout Trail ends at the Boy Scout Tree, a giant twin trunk tree, standing like an ancient guardian in the forest. Prairie Creek Redwood State Park covers a large area, with miles of hiking trails through the redwoods. Two of our favorites are the Prairie Creek Trail, from the visitor center, and the James Irving Trail going up from Fern Canyon. In the Prairie Creek area look for Roosevelt elk, often grazing in the grassy meadow areas. Tip: Do not approach the elk, especially during mating season in late summer and fall. On the western side of the park, walk through Fern Canyon, covered with walls of ferns, mini-waterfalls cascading off mossy green cliffs. If it feels like a setting for prehistoric dinosaurs, Fern Canyon was a location in “The Lost World” movie. 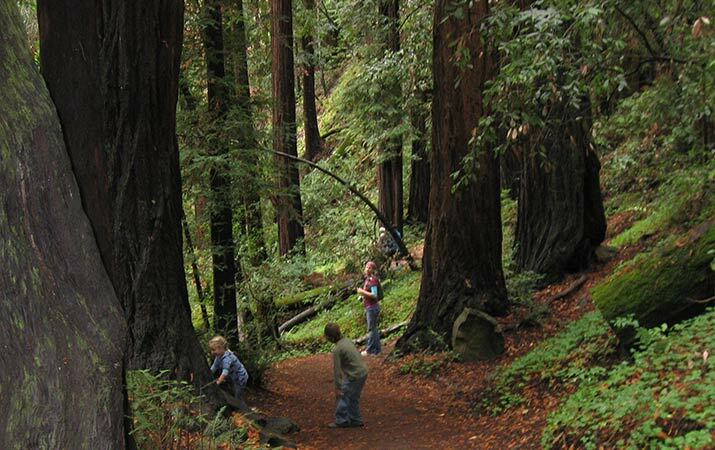 In Redwood National Park, the Lady Bird Johnson Grove the one mile trail is easy for kids of all ages. 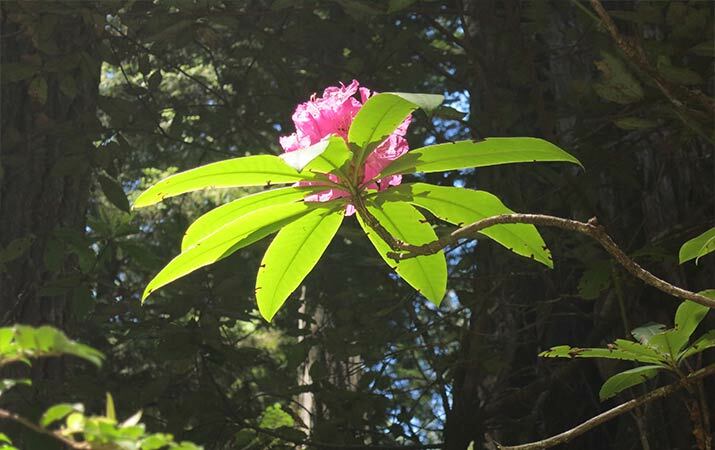 More than just redwoods, along with lush fern meadows and lichen-draped trees, in season are blooming rhododendron “rose trees,” purple Douglas iris, orange tiger lilies, white sand strawberries flowers. Another fun hike is Trillium Falls trail, which ends at a cascade bubbling down over rocks into a pool surrounded by ferns. 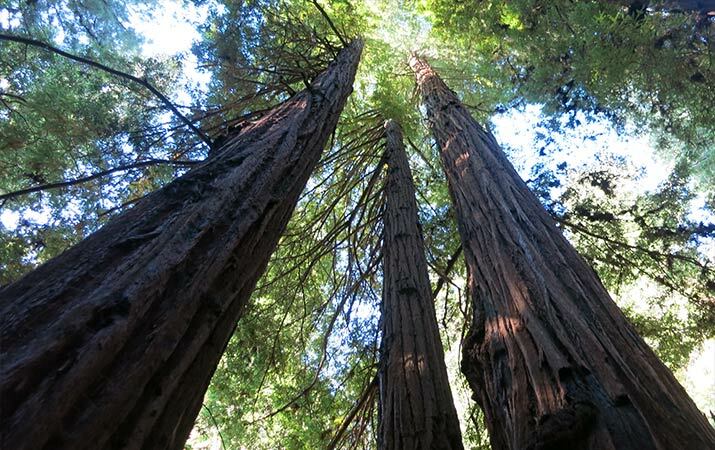 Just minutes from Guerneville in Sonoma County, go for a redwoods hike in Armstrong Redwoods State Natural Reserve. Pioneer Nature Trail is level and stroller friendly. Stop to see the Icicle Tree, a burl on the coast redwood has grown down so it looks like a melting brown icicle. In the Sonoma Valley, Jack London State Historic Park includes acres once the ranch owned by writer Jack London. You won’t find groves of coast redwoods here, but there is one ancient redwood tree that looks like something in a fantasy forest. Take the Vineyard Trail to see this extraordinary tree estimated to be 2,000 years old, a maze of gnarled side branches and new mini-trunks that grow out of the main trunk high up. 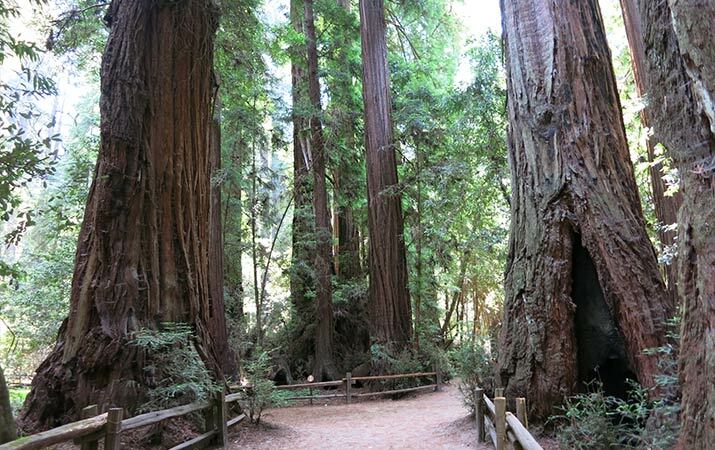 A day trip from San Francisco, Muir Woods National Monument has groves of coast redwoods, but is very popular, and parking reservations are required year round. With little kids, take Main Trail along Redwood Creek, the nature trail, or loop trails to Cathedral and Bohemian Groves. Older kids will enjoy stretching their legs on the Fern Creek and Ocean View Trails. The oldest state park in California, Big Basin Redwoods State Park was created in 1902 to preserve the coast redwoods in the Santa Cruz Mountains. Before going out to the groves, stop into the Nature Lodge with exhibits about the redwoods and wildlife. 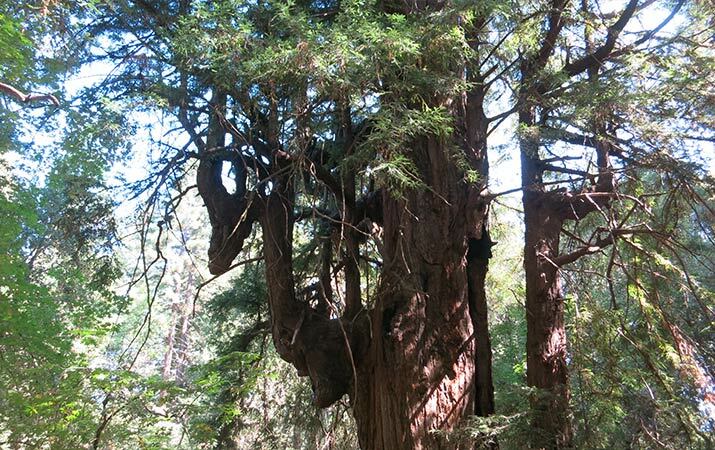 Take the Redwood Loop Trail, where you’ll see “Father of the Forest” tree, about 1,800 years old. Tip: Big Basin is about a 45 minute drive from Santa Cruz on winding roads, a full day trip. 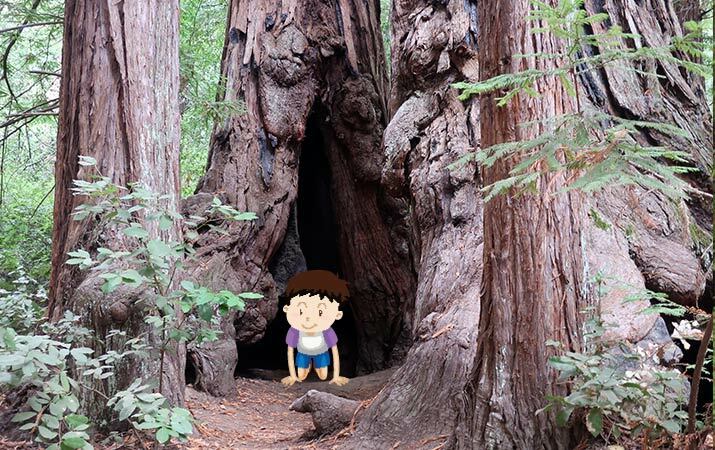 A short drive from Santa Cruz, in Henry Cowell Redwoods State Park, take the Redwood Grove Loop Trail to see The Giant, tallest tree in the grove, an albino redwood tree with white branches, and step inside the roomy Fremont Tree (bring a flashlight). 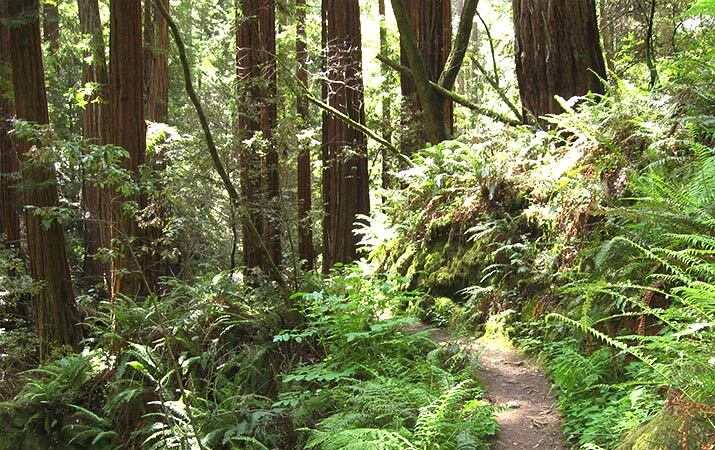 For a walk through the coast redwoods, at Pfeiffer Big Sur State Park, take the Nature Trail, less than a mile. Also at the beginning of the Buzzard’s Roose Trail are old-growth coast redwoods. The best viewing of coast redwoods is the Pfeiffer Falls trail, currently closed at the time of writing. Stretch to the Sun by Carrie A. Pearson, Susan Swan. 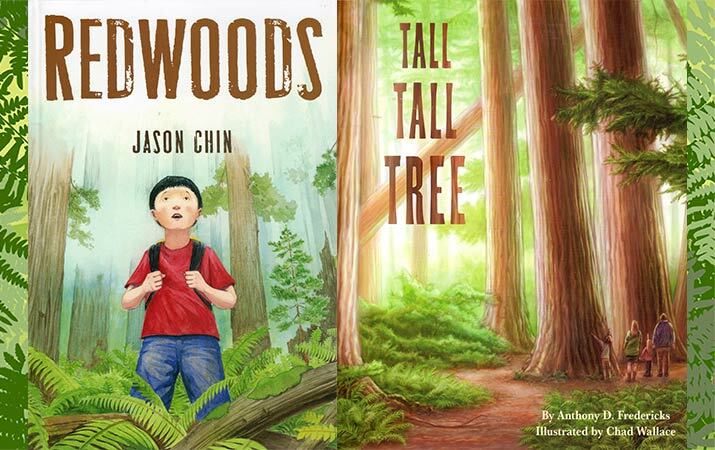 Tall Tall Tree by Anthony D. Fredericks, Chad Wallace. And the end of the book, see the actual size of a redwood tree seed. 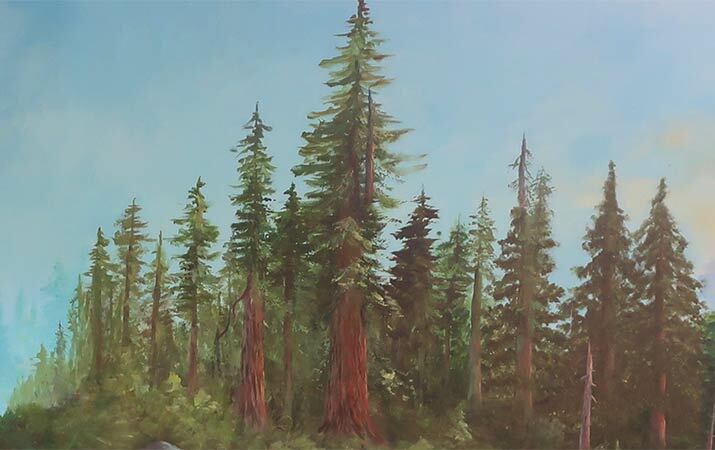 The Redwood Forests by Lisa Bullard.